In the moment I have seen a photo of this quilt on the web, I knew that I wanted to make it. The pattern is by Emily from Quilty Love and is called Cross Tile Quilt. I liked the strong bold colours and the white background. Also the blocks are 14″ x 14″ and it is a quick sewing project. As mentioned before, I am trying to use the fabrics that I have on stock. I have a big box full off fabrics from the Kona solids collection. As I wanted to make a quilt throw, I needed to choose 20 colours. The photo is before I decided on all colours, four are still missing. Made staples with the first colour combinations – they changed constantly. And voila, the top was finished and basted for quilting. Bought backing fabric during my last stay in Prague. The fabric is “European”, i.e. is has a width of 59″. I added some Kona solid in silver to top up the quilt backing. A “x-ray” photo of the quilt taken against the sun from the back. Here you can see the piece on the right with the silver solid fabric. I wasn’t sure how to quilt it. I did some thinking about the pros and cons between free motion quilting and quilting with the walking foot – and yes, the walking foot made it. I decided to quilt it with straight lines approx. 1″ apart and did guidelines with the Hera Marker. A detail photo of the quilting – the lines are somehowy straight, but I am very happy with the result. It is handmade! I have used the same fabric for the binding as in the original quilt by Emily : silver from Kona solids. I am very happy with this quilt – it turned out even better than I thought. 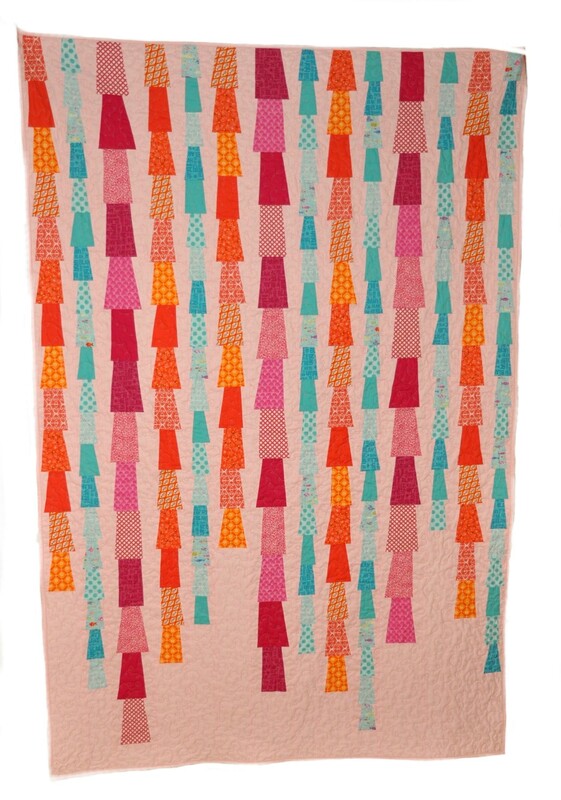 Bright colours and a simple design – once more: thanks Emily for the great pattern! Maybe this bright Cross Tile Quilt could be inspiration for your next project! On my way back home at the airport in Prague I was deciding whether to buy these glossy magazines with a lot of advertisement or to get a nice book. This time a book won : The Chef by Martin Suter. I am glad that I bought it, reading was excellent, the story fresh and there was space left for imagination. Martin Suter does not disappoint me. The last book I read from him was : Allmen und die Libellen. Another amusing story with an interesting plot. Patchwork and quilting is set aside at the moment : visiting my Mum, getting back to normal from my holiday mood and now we have my husbands son and family with us. But since I have read this post from The Burned Hand I have started to think about my attitude. Instead of finding excuses for not doing something and I just should do it!! I have all my fabrics for the Skill Builder BOM by Pile of Fabric together, so tomorrow is the right day to start this project and pick up with the others. 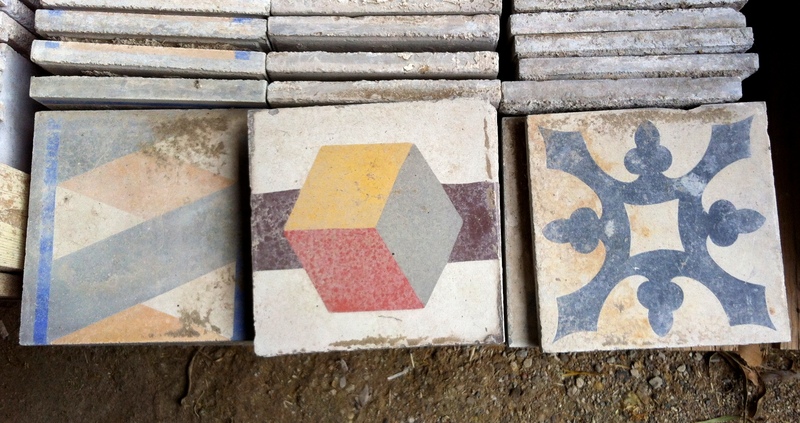 A few weeks ago we went with clients to an antique construction material shop situated about 2 hours drive from us. There were thousands and thousands of different articles on display. 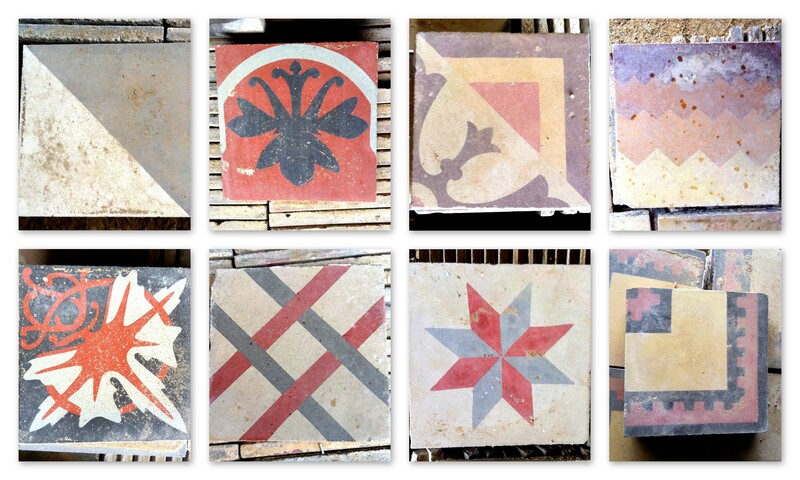 When walking around the spacious plot I found my favorite pieces : antique tiles. They have amazing designs – they are like models for patchwork patterns. I finally finished the Garlands quilt for Joan. It is a Xmas present for her granddaughter. The pattern is from the book Modern Patchwork by Elizabeth Hartman. The original size is 49″ x 68″. I added a few more rows and a column to it make to a single bed quilt. 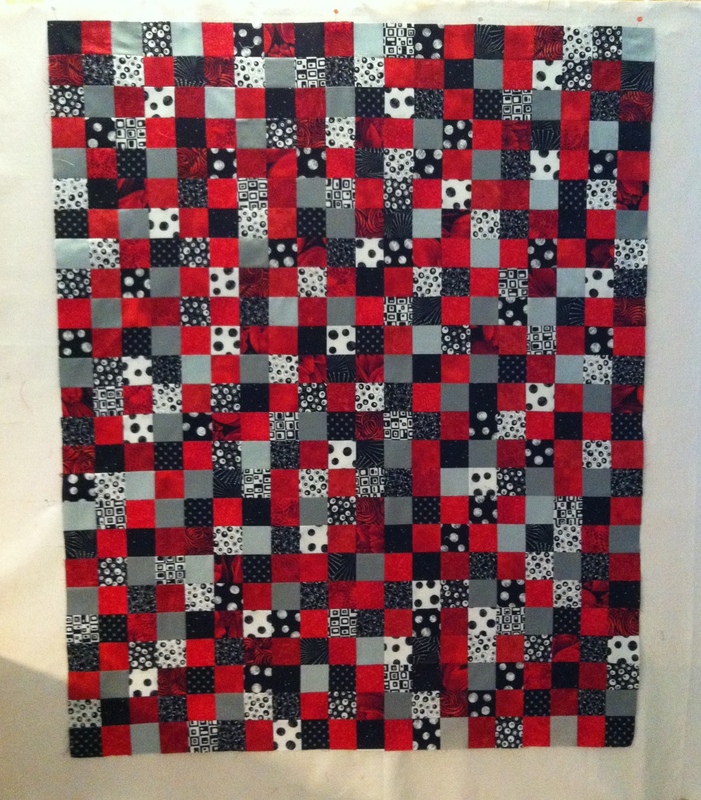 Size : 54″ x 80″; free-motion quilted with meander and loops. The backing has a polka dot fabric with a pink background and white dots. Sorry about the photo, but because of heavy rain I could not take any pictures outside. I have one more quilt in work : a Happy Birthday, Mum quilt. My mum turned 80 last Sunday and I hope to finish it till next Tuesday, so that I can take it with me to Prague. It is a throw for my Mum and for her new armchair. It has been some time since I wrote the last post. My parents were with us on a 10 day visit, so family life was the main focus in these days. I was also fairly busy at work, interpreting and translating quotes for the construction company I work for (since 9 years now). And I gave beginner classes at my local patchwork and quilting shop. I have already done 3 Monday classes and my lady pupils are happy – lucky me. But I also must admit, that I enjoy it very much! Where shall I start first? All 3 fabrics have incredible colors. The moment I saw them, I knew they are a must for my stash. Particularly the fabric on the top from Alexander Henry House Designer from the collection Paloma, La Paloma in Multi. 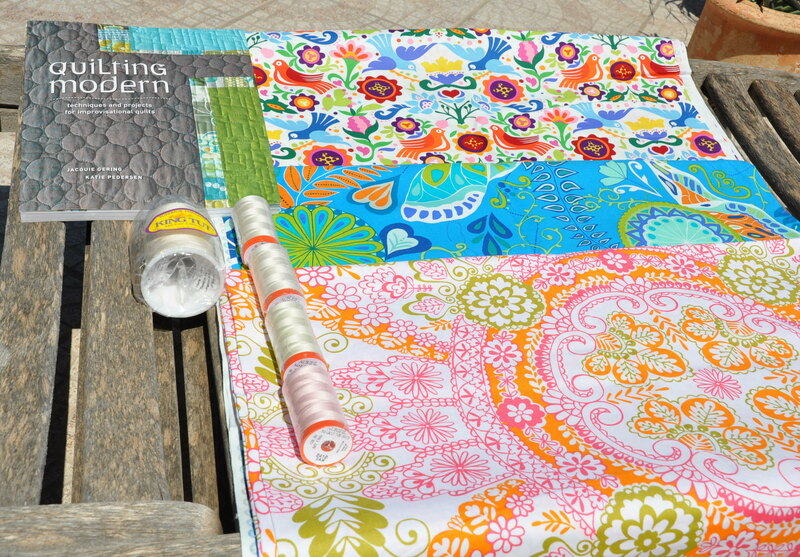 Hawthorne Threads is very nice online shop that concentrates on modern patchwork fabrics. They have a wonderfully designed website, all is clearly arranged and it is always a pleasure to order there. High quality cotton threads are a must for me. After all threads have to hold the entire quilt together, from piecing to quilting. Unfortunately I cannot buy them locally, but fortunately we have internet. 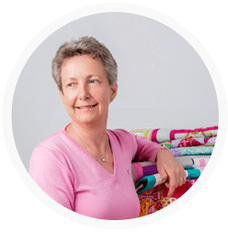 I have found Quilt Direct in the UK, have ordered there in the past and always got a very good service. This time I decided to buy piecing thread from Aurifil 50/2 in 4 different neutral shades. For quilting I also ordered a neutral, the big spool is from Superior King Tut 40/3. I have used in the past this thread for quilting my projects and I like the quality. For books we have Amazon, once more a perfect marketplace to order make worldwide. The book has wonderful and colorful patterns, I just love the quilting techniques. I didn’t have time to read it, but I certainly looked at all the photos. Please visit one of the author’s blog on Sew Katie Did. Well, it is time to start again with quilting (after my short holiday with family and making preserves). This hobby is worth everything, a perfect pursuit! There were some nice emails waiting for me when I came back home from Prague. Avis from Oh Sew Tempting had nominated me for the Kreativ Blogger Award. That was really smashing news. Avis is a very busy blogger with lots of nice ideas and understandable tutorials. I wish I would be as hard-working on my blog and quilts as she is on hers. First I had to come back to “normal life” – look what happened the last week at work, do some normal woman work at home and go shopping, help the gardener, groom the dog… Also my husbands son is here for a week. After dealing with all the different obligations, I have finally got time to write a new post. I love to live in Spain. After leaving my home town of Prague I have lived in Germany and the UK, but Spain is definitely my favorite European land. I like travelling, but over the years I got a bit lazy and stay rather at home. Time for a change!! I am fond of gardening – did this successfully in northern Europe. But in our garden we have only solid rock and gardening has become a very hard job. Get the grip to write this blog more regularly and finish my started pdf tutorials. Next time maybe some info about the Prague Patchwork meeting.